UPPER EAST SIDE, NY — Public housing residents, local elected officials and the Upper East Side's community board slammed the New York City Housing Authority for a plan to allow a 50-story private development to replace a playground on the Holmes Towers development during a heated meeting Wednesday night. Critics of the plan claimed that money the developers are committing to NYCHA repairs won't meet the need of the Holmes Tower development and that the troubled agency — which is currently negotiating a plan for greater federal oversight — can't be trusted to spend the money efficiently or responsibly. Elected officials also ripped into NYCHA for seeking mayoral zoning overrides rather than go through the city's Uniform Land Use Review Procedure, which would deprive the community board, borough president and city council from publicly reviewing the plan. The tower — to be built by Fetner Properties — will rise 530 feet above East 92nd Street and will contain 339 apartment units, half of which will be offered at market rates and half of which will be offered at regulated below-market rates, according to building plans filed with the city. Fetner will pay NYCHA $25 million up front for a 99-year ground lease at the site. All of the money will be used by NYCHA to fund repairs at the HOlmes Towers, officials said. "Why in the world does this project not go through a ULURP public review? It makes no sense," Manhattan Borough President Gale Brewer said at a public meeting Wednesday. "At the appropriate time, along with my colleagues, we're gonna fight to make sure Holmes infill goes through the review process and that you have input." Brewer added that politicians aren't ruling out going to court in order to force a public review of the project. NYCHA plans to request three mayoral zoning overrides to allow the building that does not conform to the site's current zoning regulations, NYCHA's Director of New Construction Matthew Charney said. Build 2.3 percent less open space on the lot than required for the maximum amount of residential development density allowed for the site's zoning district. Charney said that NYCHA has no plans to put the project through ULURP. The NYCHA executive said that the lengthy nature of the ULURP process would cut into the agency's timeline to begin construction on the new building and repairs to Holmes Towers this summer. Community Board 8 passed two resolutions in December asking the mayor not to provide zoning overrides and instead force the project through ULURP. The board unanimously passed another resolution Wednesday in favor of placing a hold on the construction of the new building. Tenants of NYCHA's Holmes Towers and neighboring Isaacs Houses turned out in great numbers for Wednesday's meeting. The venue at the Stanley M. Isaacs Neighborhood Center was standing-room-only when the meeting kicked off at 6:30 p.m. and was still packed when the meeting adjourned more than five hours later. Of all the dozens of residents who spoke, only one voiced support for Fetner and NYCHA's proposals. Resident Letitia Taylor, who grew up in the Holmes Towers development and is now raising her children there, described the planned tower as a "monstrosity" that would negatively affect her children's upbringing. "We used to be able to see sunlight, we used to have a breeze, we used to be able to open a window. Will this be their memory?" Taylor said Wednesday night. "And especially after seeing that view of that new monstrosity of a building that is going to be two times the size of the building we live in now." Saundrea Coleman, a former Holmes and current Isaacs resident, said that tenants in both buildings have been vocally opposed to the project since it was first proposed 2015. Coleman said tenants have marched on Gracie Mansion, held press conferences in the development and at City Hall and sent petitions to officials, "informing them over and over again that the tenants do not want this building." 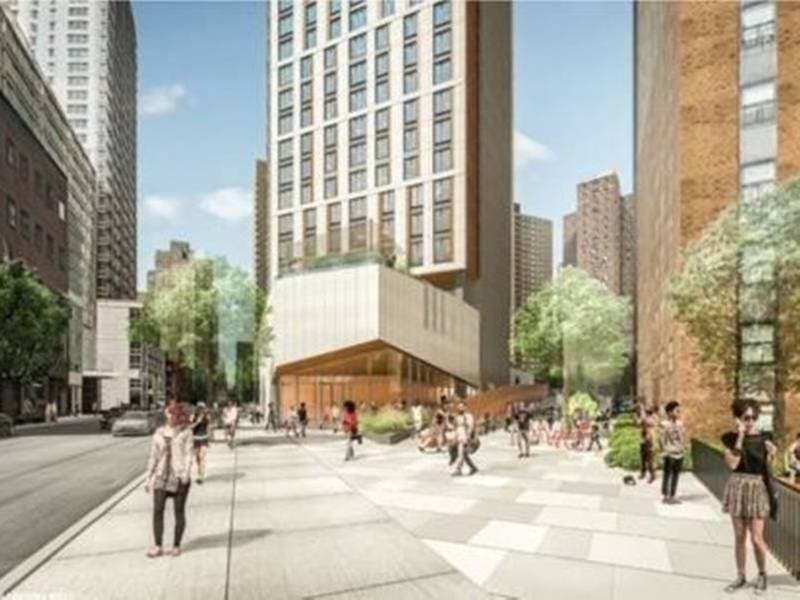 The Stanley M. Isaacs Neighborhood Center, which hosted Wednesday night's meeting, will support the tenants in fighting against NYCHA and Fetner's proposal and asking the project to go through public review, the center's director said. "We will continue to stand with all stakeholders to ensure that this project is subject to the City's Uniform Land Use Review Process, as the preservation of public housing through private investment should never conflict with the preservation of human dignity," Stanley M. Isaacs Neighborhood Center Executive Director Gregory Morris said in a statement. NYCHA's Charney acknowledged the absence of support for the project, but insisted it's necessary to fund repairs in the housing project. "We've understood that from the beginning of the process, that no one wants this to happen. The reason why we're doing this is to raise money to put back into repairs in Holmes Tower because we are in desperate need of funds for repairs," he said. NYCHA and Fetner Properties said Wednesday that they will commit to meeting with building residents to determine how tenants want the $25 million to be spent in repairs. Many tenants and community board members worried that $25 million won't even cover a significant portion of the repairs needed at the Holmes Towers, citing NYCHA's own estimates that put the development's capital needs at about $36 million. Since May 2017, Fetner has held at least 18 to 20 information sessions open to residents in the Holmes and Isaacs developments at the Stanley M. Isaacs Neighborhood Center, the development company's CEO Hal Fetner told Patch in previous conversations. "We heard the criticism that we're not engaged with the community. It's hurtful. We're disappointed," Fetner said in December. Fetner has said that he understands concerns regarding using NYCHA land for private development, but that the developer simply responded to the city's request for proposals for the site. "At the end of the day it is no secret that NYCHA needs cash. They're 32 to 40 billion in the red," Fetner said. "And you know what, at the end of the day these resident need clean, safe housing with hot water and heat... Sources need to be found to renovate these units."